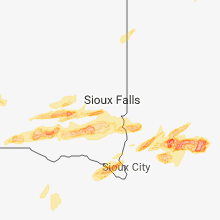 The Anderson, SD area has had 0 reports of on-the-ground hail by trained spotters, and has been under severe weather warnings 32 times during the past 12 months. 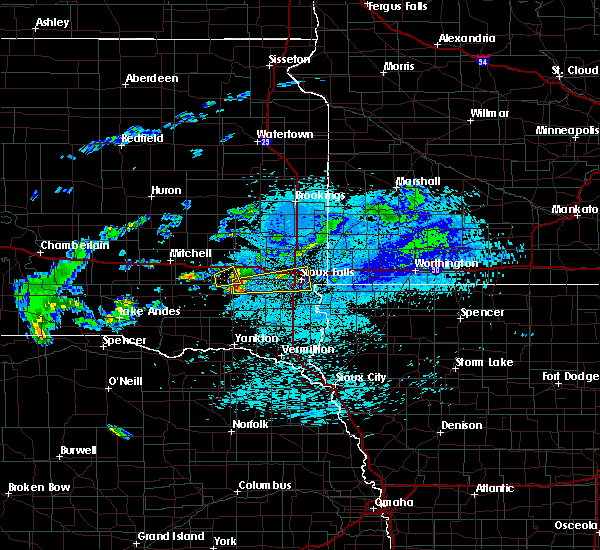 Doppler radar has detected hail at or near Anderson, SD on 13 occasions, including 2 occasions during the past year. 9/20/2018 3:50 PM CDT At 349 pm cdt, a severe thunderstorm was located over rowena, or 9 miles east of sioux falls, moving northeast at 50 mph (radar indicated). Hazards include 60 mph wind gusts and penny size hail. Expect damage to roofs, siding, and trees. this severe storm will be near, valley springs around 355 pm cdt. hills around 400 pm cdt. beaver creek around 405 pm cdt. luverne, hardwick and blue mounds state park around 415 pm cdt. 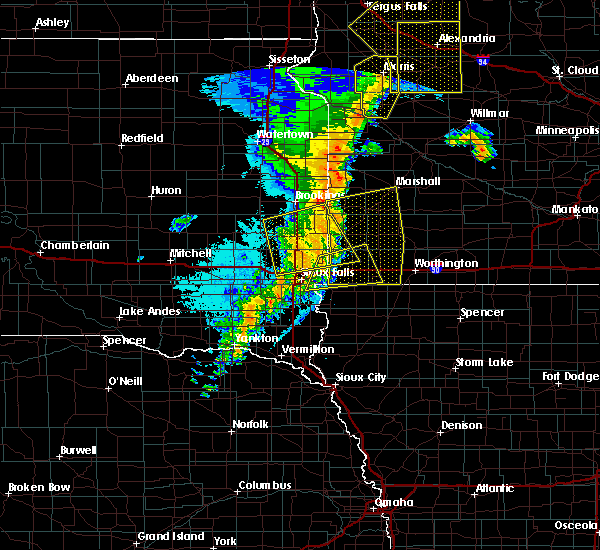 A tornado watch remains in effect until 1100 pm cdt for southwestern minnesota. 9/20/2018 3:32 PM CDT At 331 pm cdt, a severe thunderstorm was located near worthing, or 11 miles south of sioux falls, moving northeast at 60 mph (radar indicated). Hazards include 60 mph wind gusts and penny size hail. Expect damage to roofs, siding, and trees. this severe thunderstorm will be near, southeast sioux falls around 340 pm cdt. harrisburg and lake alvin state recreation area around 340 pm cdt. rowena around 345 pm cdt. brandon and larchwood around 350 pm cdt. valley springs and hills around 355 pm cdt. beaver creek around 400 pm cdt. Luverne, hardwick and blue mounds state park around 410 pm cdt. 8/28/2018 2:25 AM CDT At 225 am cdt, a severe thunderstorm was located near brandon, or near sioux falls, moving east at 50 mph (trained weather spotters). Hazards include 60 mph wind gusts and half dollar size hail. Hail damage to vehicles is expected. expect wind damage to roofs, siding, and trees. this severe thunderstorm will be near, valley springs around 235 am cdt. hills around 240 am cdt. beaver creek around 245 am cdt. 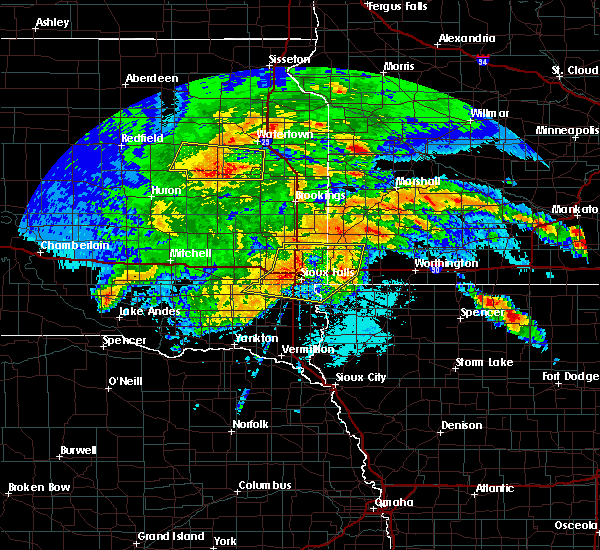 luverne around 250 am cdt. Other locations impacted by this severe thunderstorm include magnolia and steen. 8/28/2018 2:21 AM CDT At 219 am cdt, a severe thunderstorm was located over sioux falls, moving east at 45 mph (public. 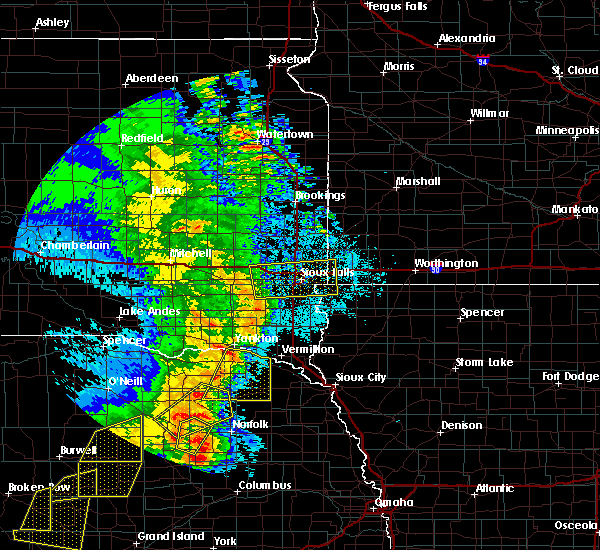 at 219 am cdt quarter sized hail was reported in central sioux falls). Hazards include 60 mph wind gusts and half dollar size hail. Hail damage to vehicles is expected. expect wind damage to roofs, siding, and trees. This severe thunderstorm will remain over sioux falls and mainly rural areas of south central minnehaha county. 8/28/2018 2:08 AM CDT At 206 am cdt, a severe thunderstorm was located over wall lake, or 11 miles west of sioux falls, moving east at 45 mph (radar indicated). Hazards include golf ball size hail and 60 mph wind gusts. People and animals outdoors will be injured. expect hail damage to roofs, siding, windows, and vehicles. expect wind damage to roofs, siding, and trees. this severe storm will be near, the west side of sioux falls at 215 am cdt. 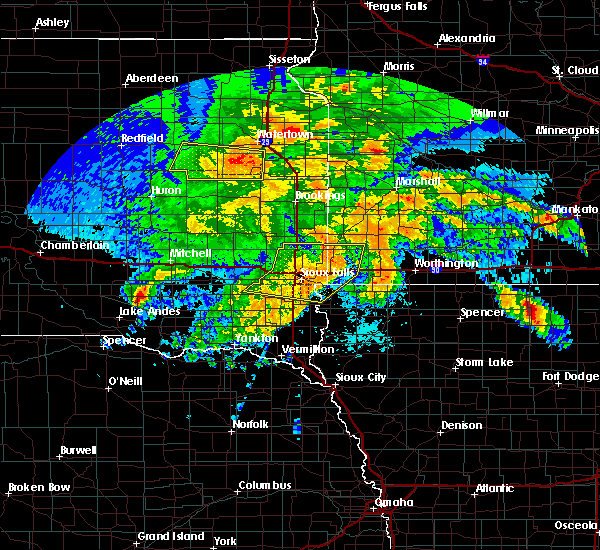 Sioux falls around 220 am cdt the east side of sioux falls at 225 am cdt. 8/28/2018 2:02 AM CDT At 201 am cdt, a severe thunderstorm was located near wall lake, or 8 miles northeast of parker, moving east at 50 mph (radar indicated). Hazards include 60 mph wind gusts and half dollar size hail. Hail damage to vehicles is expected. expect wind damage to roofs, siding, and trees. this severe storm will be near, wall lake around 205 am cdt. tea around 215 am cdt. west side of sioux falls around 215 am cdt. 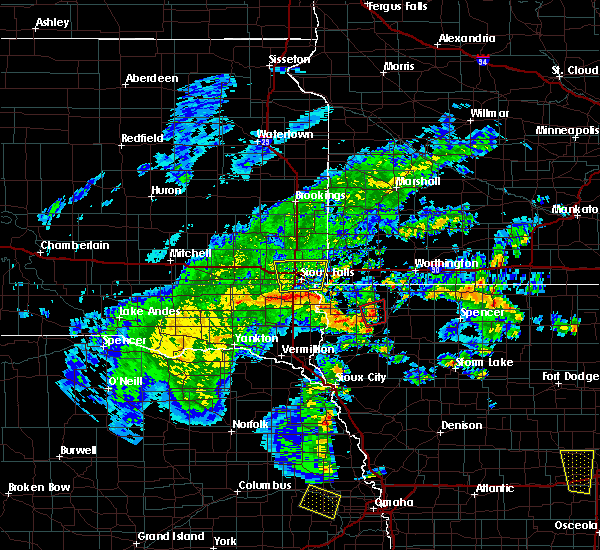 sioux falls and harrisburg around 220 am cdt. Lake alvin state recreation area around 225 am cdt. 8/28/2018 1:43 AM CDT At 143 am cdt, a severe thunderstorm was located over dolton, or 10 miles southwest of lake vermillion state recreation area, moving east at 45 mph (radar indicated). Hazards include 60 mph wind gusts and half dollar size hail. Hail damage to vehicles is expected. expect wind damage to roofs, siding, and trees. this severe thunderstorm will be near, monroe around 150 am cdt. 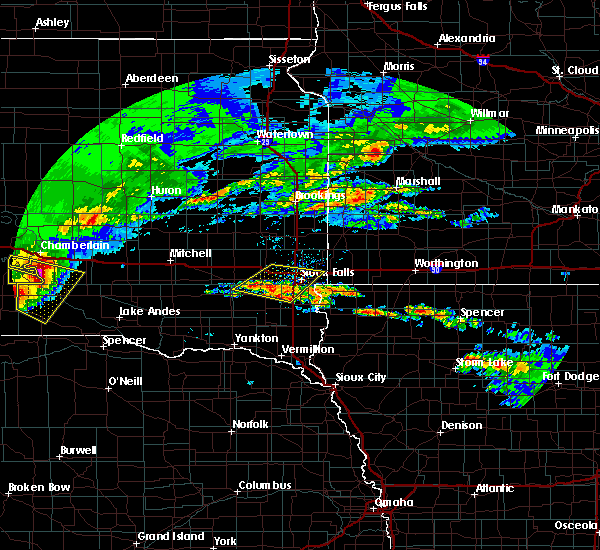 hartford and wall lake around 210 am cdt. tea around 215 am cdt. 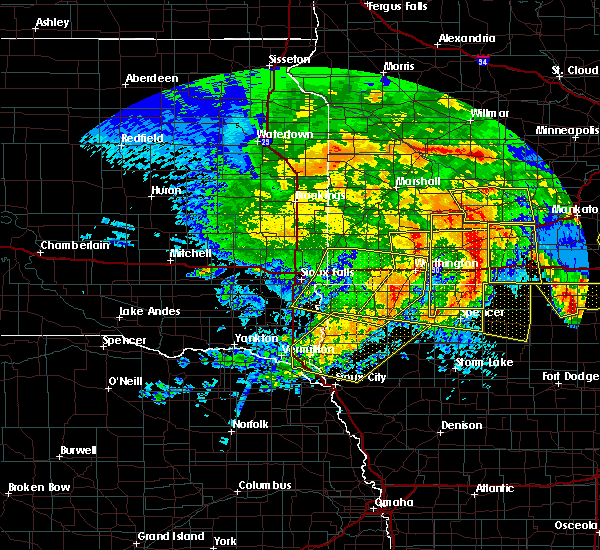 sioux falls and harrisburg around 225 am cdt. Lake alvin state recreation area around 230 am cdt. 8/5/2018 2:28 AM CDT At 228 am cdt, severe thunderstorms were located along a line extending from near hills to near alvord to inwood to 7 miles south of worthing, moving southeast at 20 mph. these are very dangerous storms (radar indicated). Hazards include 80 mph wind gusts and penny size hail. Flying debris will be dangerous to those caught without shelter. mobile homes will be heavily damaged. expect considerable damage to roofs, windows, and vehicles. extensive tree damage and power outages are likely. these severe storms will be near, inwood, alvord and fairview around 235 am cdt. rock rapids, rock valley, doon, hudson and newton hills state park around 245 am cdt. Other locations impacted by these severe thunderstorms include steen. 8/5/2018 2:14 AM CDT At 213 am cdt, severe thunderstorms were located along a line extending from near beaver creek to near larchwood to near canton to near worthing, moving southeast at 35 mph. these are very dangerous storms (radar indicated). Hazards include 80 mph wind gusts and penny size hail. Flying debris will be dangerous to those caught without shelter. mobile homes will be heavily damaged. expect considerable damage to roofs, windows, and vehicles. extensive tree damage and power outages are likely. 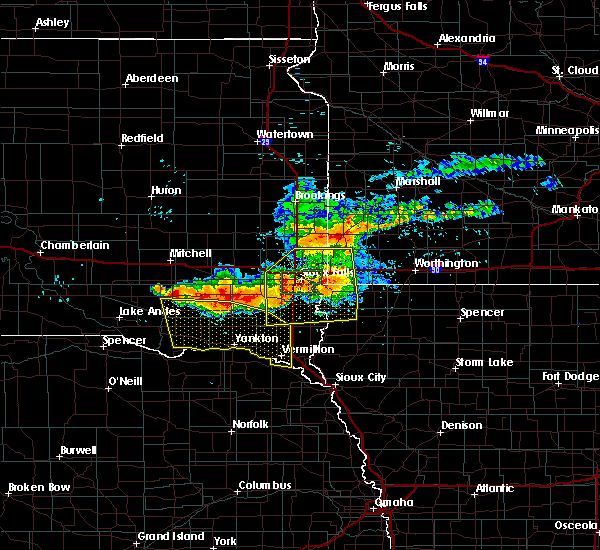 these severe storms will be near, luverne, inwood, lester and fairview around 220 am cdt. alvord around 225 am cdt. 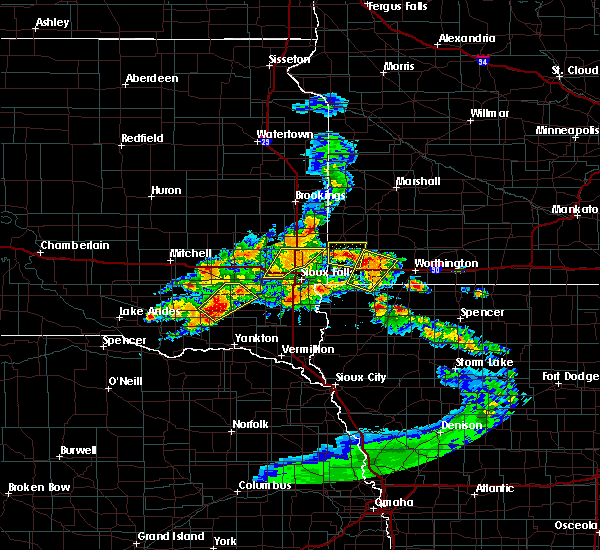 rock rapids, rock valley and doon around 235 am cdt. 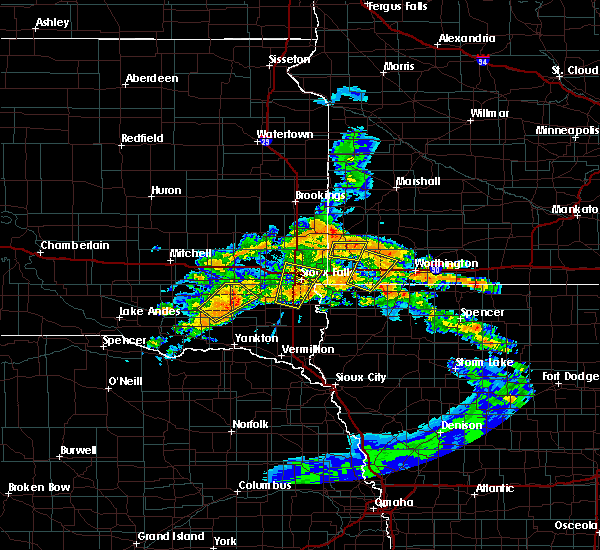 hudson around 245 am cdt. Other locations impacted by these severe thunderstorms include steen. 8/5/2018 2:14 AM CDT At 154 am cdt, severe thunderstorms were located along a line extending from palisades state park to near rowena to harrisburg to chancellor, moving southeast at 20 mph (radar indicated). Hazards include 70 mph wind gusts and penny size hail. Expect considerable tree damage. damage is likely to mobile homes, roofs, and outbuildings. severe thunderstorms will be near, harrisburg, worthing and rowena around 200 am cdt. lake alvin state recreation area around 205 am cdt. valley springs around 215 am cdt. larchwood and beaver creek around 220 am cdt. canton around 230 am cdt. hills and newton hills state park around 235 am cdt. inwood around 240 am cdt. 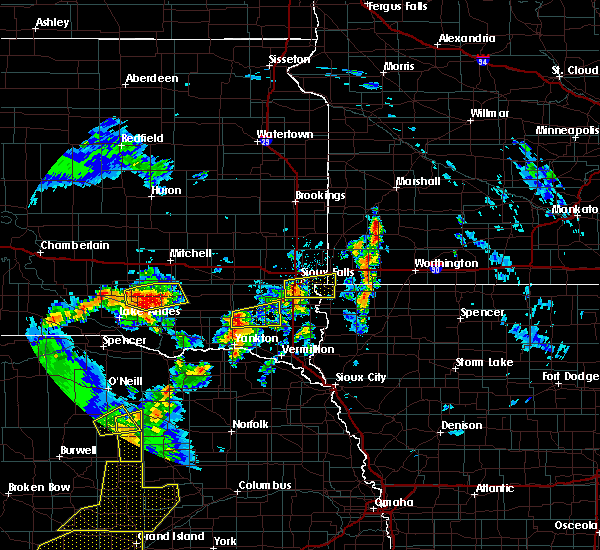 rock rapids, doon, hudson, lester, alvord and fairview around 245 am cdt. Other locations impacted by these severe thunderstorms include steen. 8/5/2018 1:54 AM CDT At 154 am cdt, severe thunderstorms were located along a line extending from palisades state park to near rowena to harrisburg to chancellor, moving southeast at 20 mph (radar indicated). Hazards include 70 mph wind gusts and penny size hail. Expect considerable tree damage. damage is likely to mobile homes, roofs, and outbuildings. severe thunderstorms will be near, harrisburg, worthing and rowena around 200 am cdt. lake alvin state recreation area around 205 am cdt. valley springs around 215 am cdt. larchwood and beaver creek around 220 am cdt. canton around 230 am cdt. hills and newton hills state park around 235 am cdt. inwood around 240 am cdt. 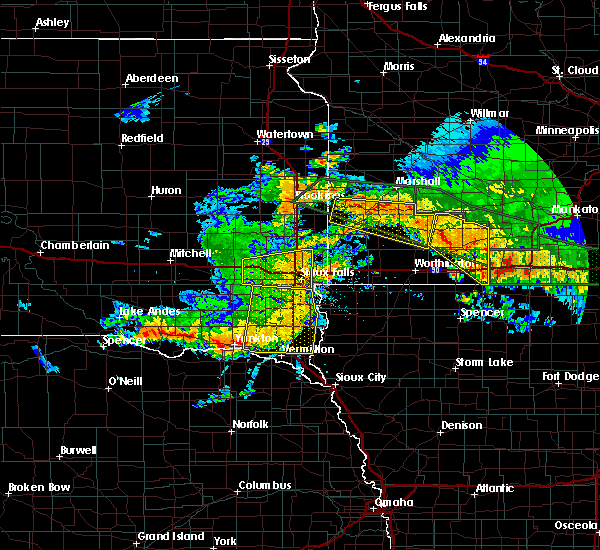 rock rapids, doon, hudson, lester, alvord and fairview around 245 am cdt. Other locations impacted by these severe thunderstorms include steen. 8/5/2018 1:31 AM CDT At 131 am cdt, a severe thunderstorm was located near crooks, or 12 miles northwest of sioux falls, moving northeast at 15 mph (radar indicated). Hazards include 60 mph wind gusts and penny size hail. Expect damage to roofs, siding, and trees. 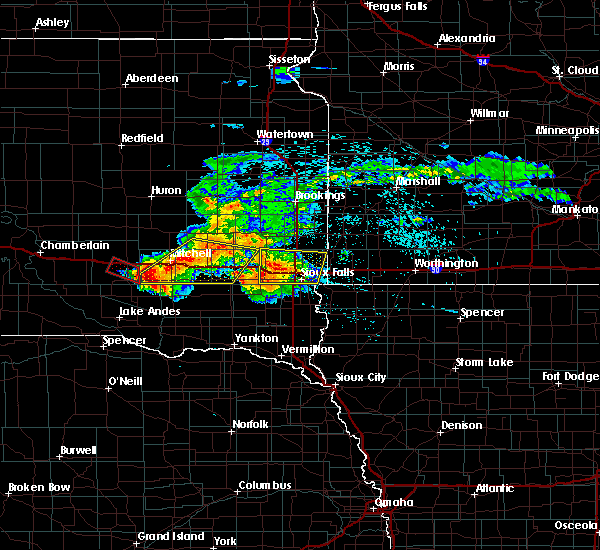 This severe storm will be near, dell rapids and baltic around 200 am cdt. 8/5/2018 1:20 AM CDT At 119 am cdt, a severe thunderstorm was located near hartford, or 11 miles northwest of sioux falls, moving northeast at 15 mph (radar indicated). Hazards include 60 mph wind gusts and quarter size hail. Hail damage to vehicles is expected. expect wind damage to roofs, siding, and trees. this severe thunderstorm will be near, crooks around 130 am cdt. 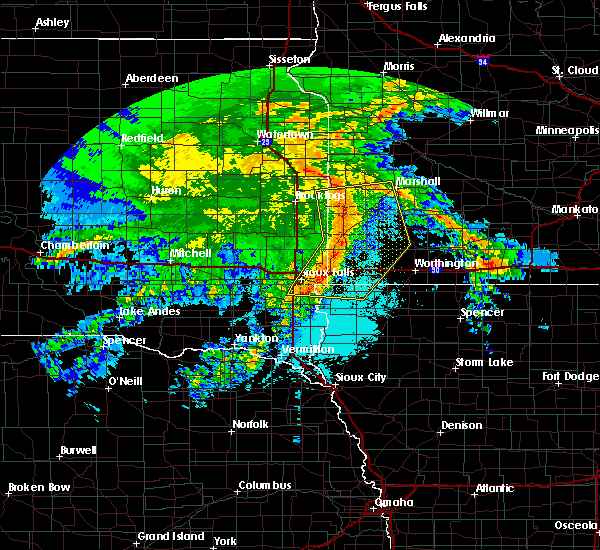 sioux falls around 135 am cdt. colton around 140 am cdt. 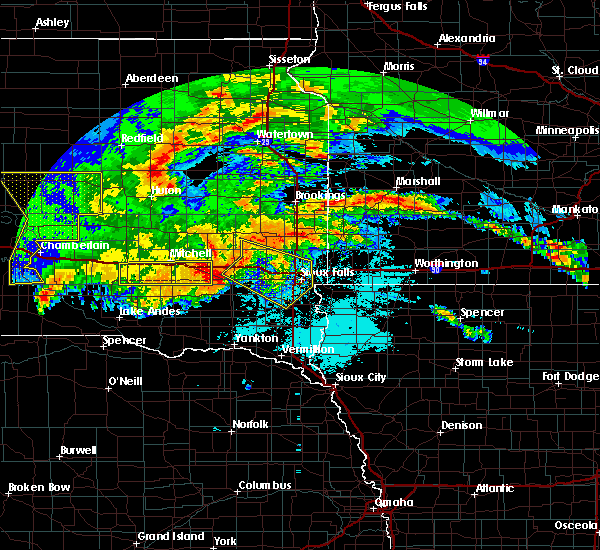 Dell rapids and baltic around 200 am cdt. 6/1/2018 10:11 PM CDT The severe thunderstorm warning for northwestern lyon, southwestern rock, minnehaha, northern lincoln, southeastern mccook and northeastern turner counties will expire at 1015 pm cdt, the storm which prompted the warning has weakened below severe limits, and no longer poses an immediate threat to life or property. therefore, the warning will be allowed to expire. 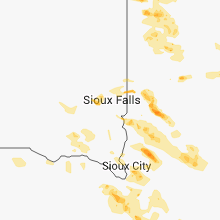 the strong wind signature which was evident earlier south of montrose has weakened some as it crossed the sioux falls metro, but winds gusting to around 50 mph will be common as it moves eastward into southwest minnesota along i 90 and extreme northwest iowa. 6/1/2018 9:55 PM CDT At 954 pm cdt, a severe thunderstorm was located near sioux falls, moving east at 40 mph (radar indicated). Hazards include 60 mph wind gusts. Expect damage to roofs, siding, and trees. 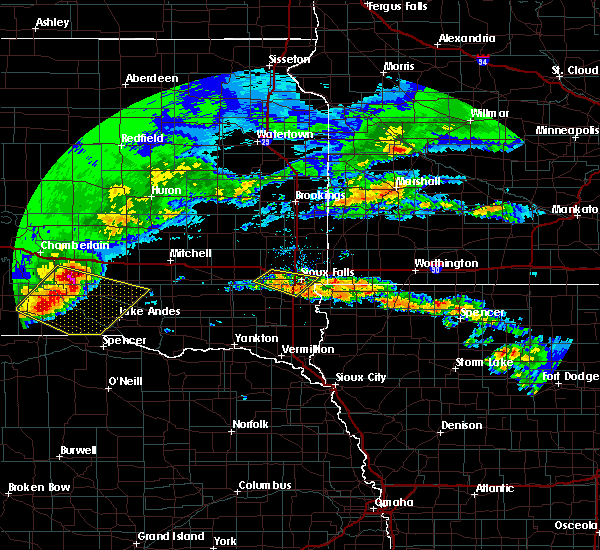 this severe storm will be near, sioux falls around 1000 pm cdt. brandon, valley springs, palisades state park and rowena around 1015 pm cdt. Numerous observations of winds near 50 mph have been received. 6/1/2018 9:34 PM CDT At 933 pm cdt, a severe thunderstorm was located over wall lake, or 10 miles southeast of lake vermillion state recreation area, moving east at 50 mph (radar indicated). Hazards include 60 mph wind gusts. Expect damage to roofs, siding, and trees. 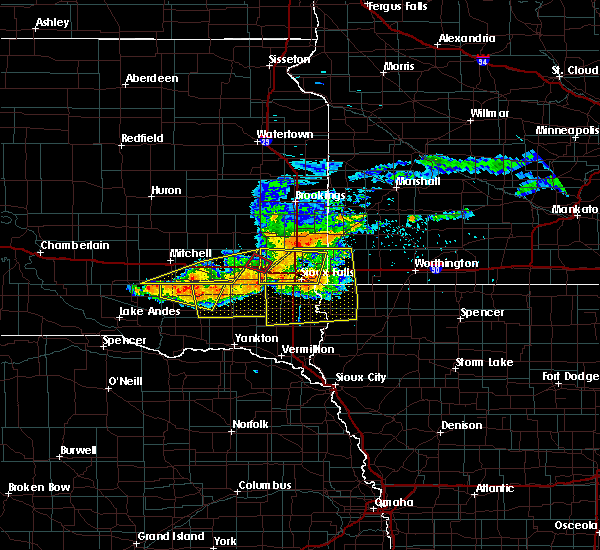 this severe thunderstorm will be near, tea around 945 pm cdt. 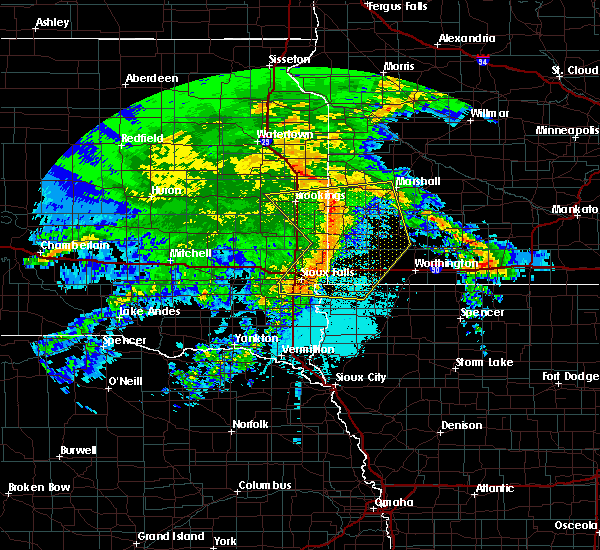 sioux falls and harrisburg around 950 pm cdt. lake alvin state recreation area around 955 pm cdt. brandon and rowena around 1000 pm cdt. larchwood and valley springs around 1005 pm cdt. A half mile north of parker, a 63 mph wind gust was reported by storm chasers. 9/19/2017 11:51 PM CDT At 1150 pm cdt, a severe thunderstorm was located near beaver creek, or 9 miles west of luverne, moving east at 50 mph (radar indicated). Hazards include 70 mph wind gusts. Expect considerable tree damage. damage is likely to mobile homes, roofs, and outbuildings. 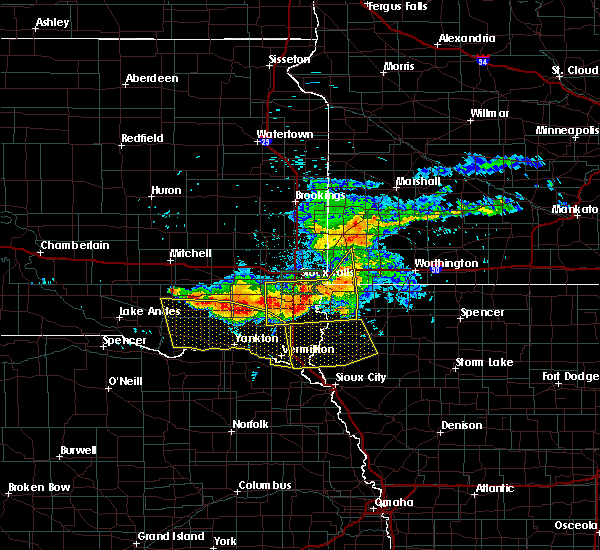 this severe storm will be near, luverne and blue mounds state park around 1205 am cdt. Other locations impacted by this severe thunderstorm include magnolia, kenneth and steen. 9/19/2017 11:29 PM CDT At 1129 pm cdt, a severe thunderstorm was located near sioux falls, moving east at 50 mph (radar indicated). Hazards include 70 mph wind gusts. Expect considerable tree damage. damage is likely to mobile homes, roofs, and outbuildings. this severe thunderstorm will be near, brandon and rowena around 1140 pm cdt. 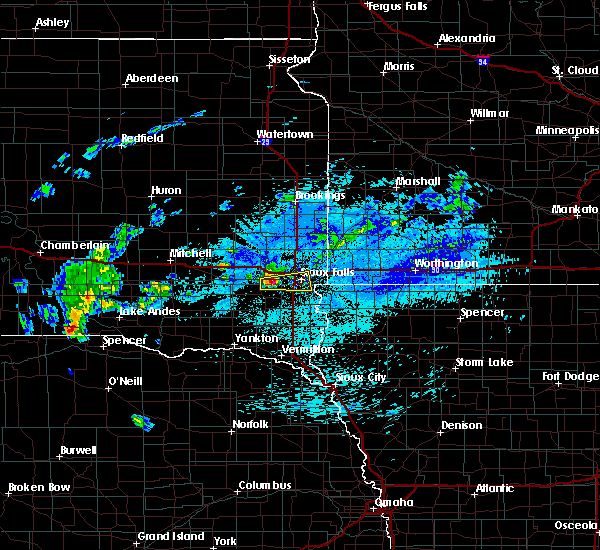 garretson, valley springs and palisades state park around 1145 pm cdt. beaver creek around 1155 pm cdt. luverne, hardwick and blue mounds state park around 1205 am cdt. Other locations impacted by this severe thunderstorm include magnolia, kenneth and steen. 8/21/2017 11:32 AM CDT At 1132 am cdt, a severe thunderstorm was located near wall lake, or 9 miles west of sioux falls, moving northeast at 20 mph (radar indicated). Hazards include quarter size hail. Damage to vehicles is expected. 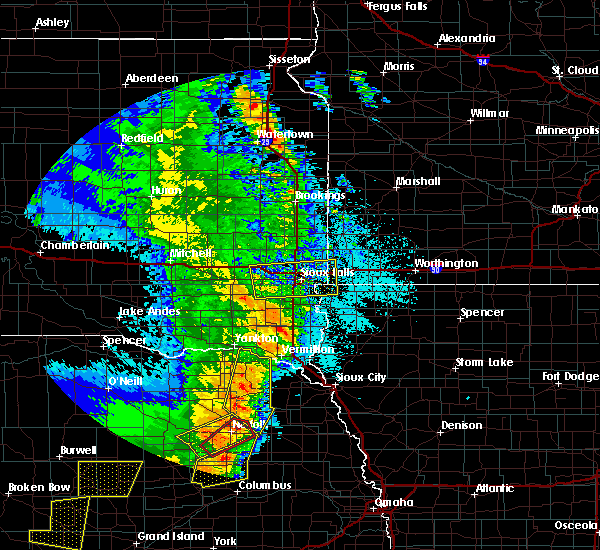 This severe storm will be near, sioux falls around 1145 am cdt. 8/21/2017 11:06 AM CDT At 1106 am cdt, a severe thunderstorm was located near wall lake, or 7 miles northeast of parker, moving northeast at 20 mph (radar indicated). Hazards include quarter size hail. Damage to vehicles is expected. this severe thunderstorm will be near, wall lake around 1120 am cdt. hartford around 1135 am cdt. 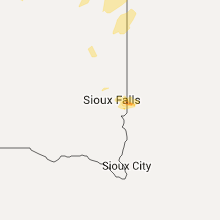 Sioux falls and crooks around 1145 am cdt. 6/27/2017 6:11 PM CDT At 1110 pm cdt, a severe thunderstorm was located near harrisburg, or near sioux falls, moving east at 25 mph (trained weather spotters. at 1105 pm cdt ping pong hail was reported in tea). Hazards include ping pong ball size hail and 60 mph wind gusts. People and animals outdoors will be injured. expect hail damage to roofs, siding, windows, and vehicles. expect wind damage to roofs, siding, and trees. this severe storm will be near, harrisburg around 1115 pm cdt. lake alvin state recreation area around 1125 pm cdt. rowena around 1135 pm cdt. Larchwood and valley springs around 1145 pm cdt. 6/27/2017 6:02 PM CDT At 1102 pm cdt, a severe thunderstorm was located over tea, or 7 miles southwest of sioux falls, moving east at 25 mph (radar indicated). Hazards include 60 mph wind gusts and half dollar size hail. Hail damage to vehicles is expected. expect wind damage to roofs, siding, and trees. this severe thunderstorm will be near, harrisburg around 1115 pm cdt. lake alvin state recreation area around 1125 pm cdt. rowena around 1135 pm cdt. Larchwood and valley springs around 1145 pm cdt. 6/13/2017 8:49 PM CDT At 848 pm cdt, severe thunderstorms were located along a line extending from near baltic to near crooks to near lennox, moving northeast at 50 mph (trained weather spotters. at 840 pm 60 mph winds and nickel size hail were reported near hartford). Hazards include 70 mph wind gusts and half dollar size hail. Hail damage to vehicles is expected. expect considerable tree damage. wind damage is also likely to mobile homes, roofs, and outbuildings. 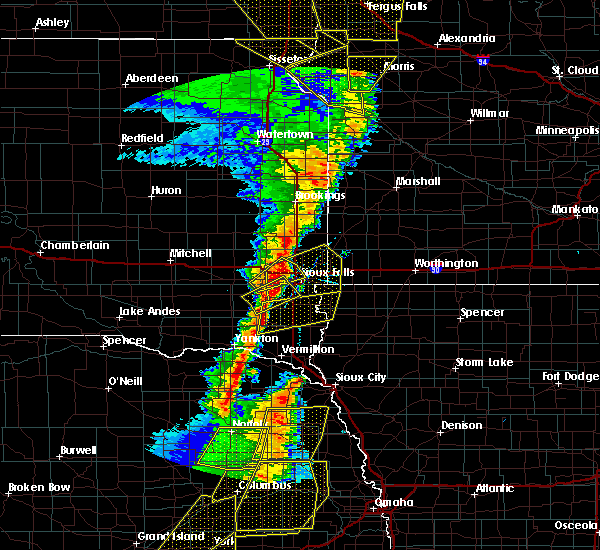 these severe storms will be near, baltic around 855 pm cdt. palisades state park and lake alvin state recreation area around 905 pm cdt. 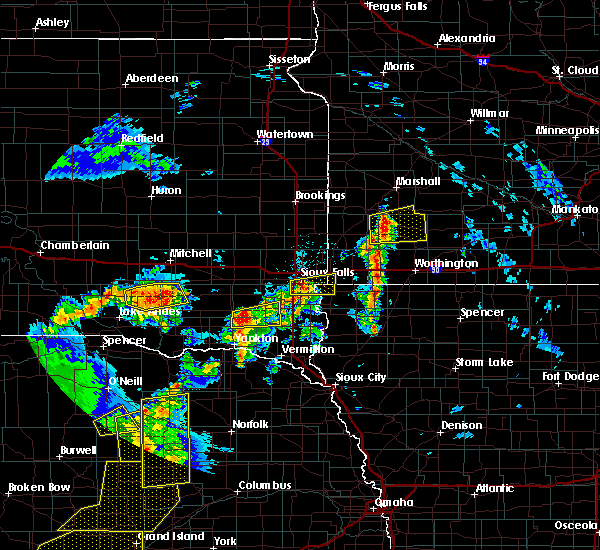 garretson, sherman and rowena around 910 pm cdt. brandon, larchwood and valley springs around 915 pm cdt. A tornado watch remains in effect until 200 am cdt for northwestern iowa, southwestern minnesota, and southeastern and east central south dakota. 6/13/2017 8:41 PM CDT At 840 pm cdt, a severe thunderstorm was located over parker, moving northeast at 60 mph. this storm has had a history of producing quarter size hail (radar indicated). Hazards include 70 mph wind gusts and half dollar size hail. Hail damage to vehicles is expected. expect considerable tree damage. wind damage is also likely to mobile homes, roofs, and outbuildings. this severe thunderstorm will be near, wall lake around 850 pm cdt. tea around 855 pm cdt. harrisburg around 900 pm cdt. 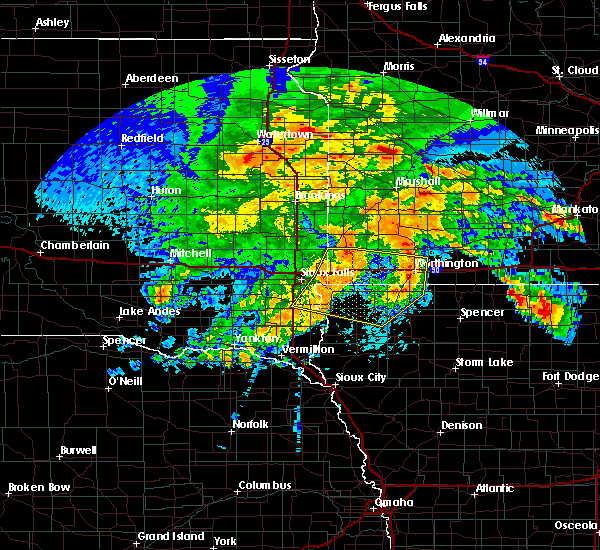 sioux falls around 905 pm cdt. brandon and rowena around 910 pm cdt. garretson, valley springs, sherman and palisades state park around 915 pm cdt. A tornado watch remains in effect until 200 am cdt for northwestern iowa, southwestern minnesota, and southeastern and east central south dakota. 6/12/2017 11:40 AM CDT The severe thunderstorm warning for northwestern lyon, southwestern rock, southeastern minnehaha and northern lincoln counties will expire at 1145 am cdt, the storm which prompted the warning has weakened below severe limits, and no longer poses an immediate threat to life or property. therefore the warning will be allowed to expire. however pea size hail and heavy rain are still possible with this thunderstorm. 6/12/2017 11:09 AM CDT At 1109 am cdt, a severe thunderstorm was located over harrisburg, or near sioux falls, moving northeast at 20 mph (radar indicated). Hazards include half dollar size hail. Damage to vehicles is expected. 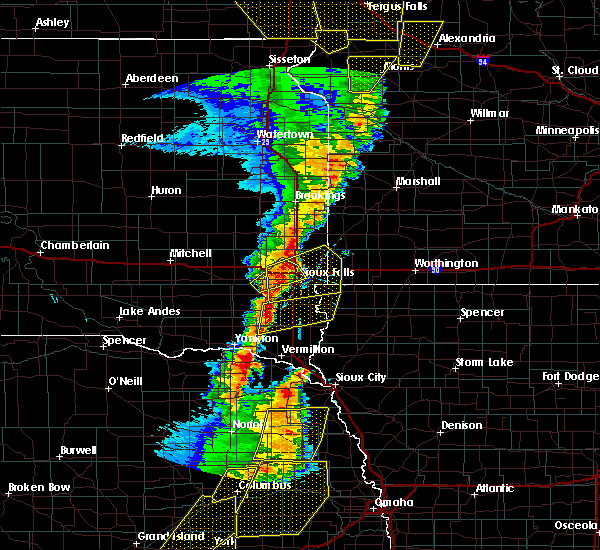 this severe thunderstorm will be near, sioux falls and rowena around 1130 am cdt. brandon and valley springs around 1145 am cdt. Other locations impacted by this severe thunderstorm include steen. 6/12/2017 11:05 AM CDT At 1105 am cdt, a severe thunderstorm was located near tea, or near sioux falls, moving north at 30 mph (radar indicated). Hazards include half dollar size hail. Damage to vehicles is expected. 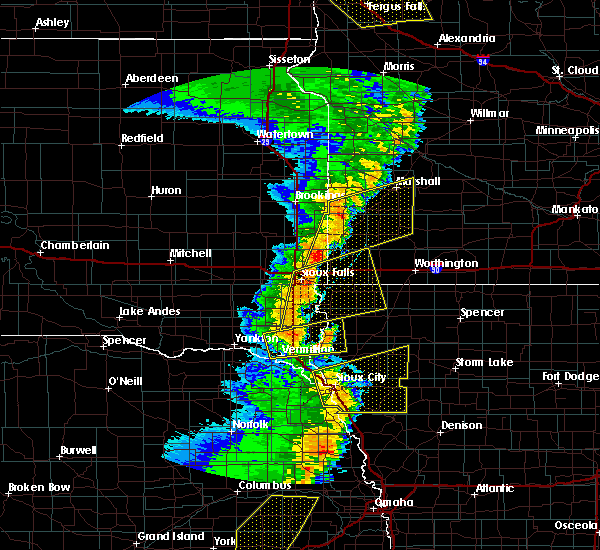 This severe storm will be near, sioux falls around 1115 am cdt. 6/12/2017 10:49 AM CDT At 1049 am cdt, a severe thunderstorm was located near lennox, or 13 miles west of canton, moving north at 30 mph (radar indicated). Hazards include half dollar size hail. Damage to vehicles is expected. this severe thunderstorm will be near, tea around 1100 am cdt. harrisburg around 1105 am cdt. 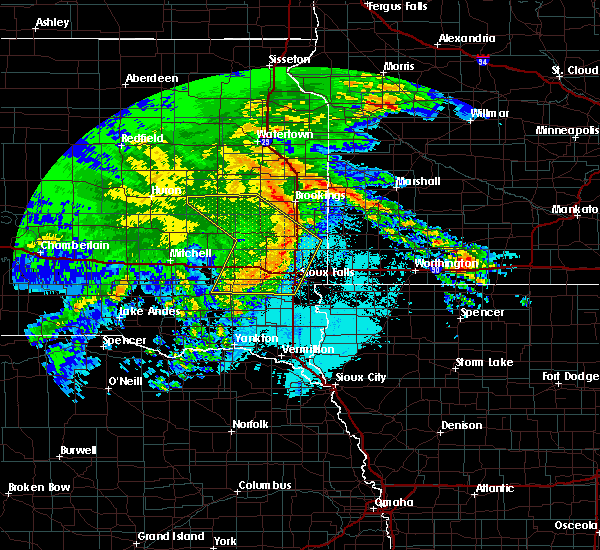 Sioux falls around 1115 am cdt. 5/17/2017 2:47 PM CDT At 247 pm cdt, a severe thunderstorm was located near sioux falls, moving north at 45 mph (radar indicated). Hazards include 60 mph wind gusts and penny size hail. Expect damage to roofs, siding, and trees. This severe storm will be near, crooks around 255 pm cdt. 5/17/2017 2:34 PM CDT At 234 pm cdt, a severe thunderstorm was located over harrisburg, or near sioux falls, moving north at 35 mph (radar indicated). Hazards include 60 mph wind gusts and penny size hail. Expect damage to roofs, siding, and trees. this severe thunderstorm will be near, rowena around 240 pm cdt. 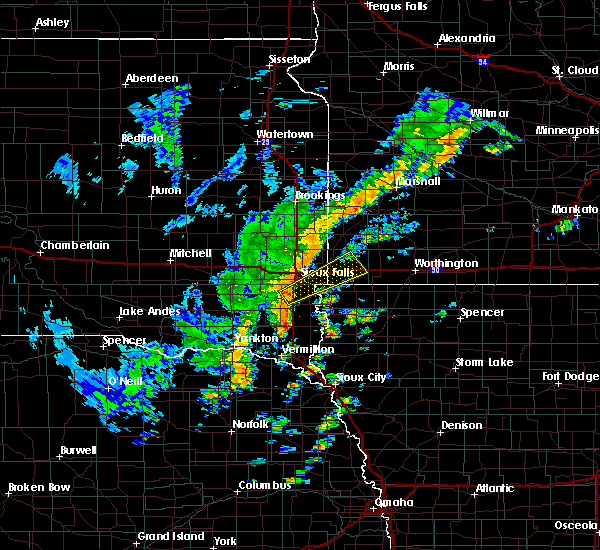 sioux falls and brandon around 255 pm cdt. Crooks around 300 pm cdt. 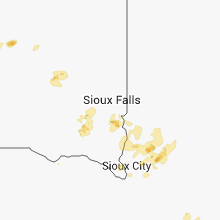 7/17/2016 12:37 AM CDT At 1236 am cdt, a severe thunderstorm was located over valley springs, or 12 miles east of sioux falls, moving east at 50 mph (radar indicated). Hazards include 70 mph wind gusts. Expect considerable tree damage. damage is likely to mobile homes, roofs, and outbuildings. this severe thunderstorm will be near, hills and beaver creek around 1245 am cdt. luverne around 1255 am cdt. ellsworth around 100 am cdt. Other locations impacted by this severe thunderstorm include magnolia and steen. 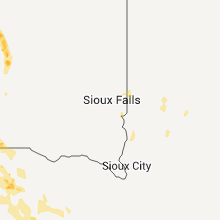 7/17/2016 12:28 AM CDT At 1228 am cdt, a severe thunderstorm was located near crooks, or 10 miles northwest of sioux falls, moving east at 35 mph (radar indicated). Hazards include 70 mph wind gusts. Expect considerable tree damage. damage is likely to mobile homes, roofs, and outbuildings. 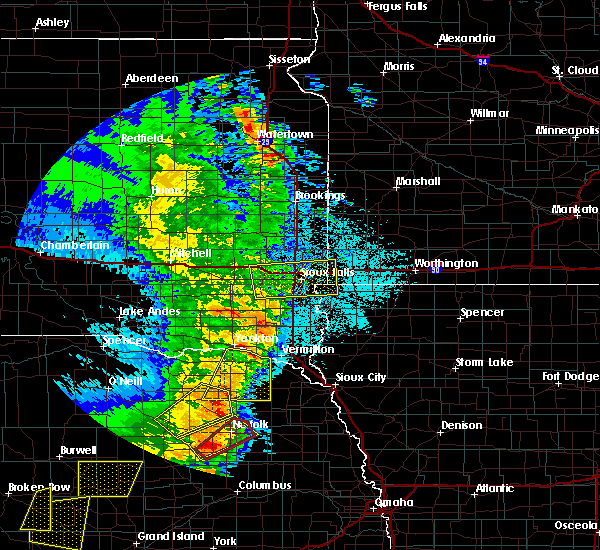 This severe storm will be near, sioux falls and baltic around 1240 am cdt. 7/17/2016 12:00 AM CDT At 1200 am cdt, a severe thunderstorm was located over humboldt, or near lake vermillion state recreation area, moving east at 35 mph (radar indicated). Hazards include 60 mph wind gusts. Expect damage to roofs. siding. and trees. this severe thunderstorm will be near, hartford around 1215 am cdt. crooks around 1225 am cdt. 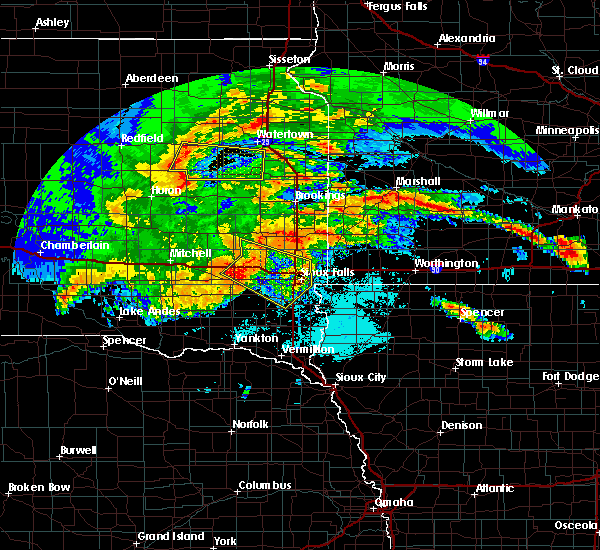 sioux falls around 1230 am cdt. Baltic around 1235 am cdt. 6/17/2016 8:17 PM CDT At 816 pm cdt, a severe thunderstorm was located near wall lake, or 7 miles southeast of lake vermillion state recreation area, moving southwest at 30 mph (radar indicated). Hazards include 60 mph wind gusts. Expect damage to roofs. siding. And trees. 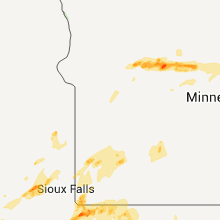 6/22/2015 5:41 AM CDT The severe thunderstorm warning for lyon, northern sioux, osceola, northwestern o`brien, nobles, rock, southeastern minnehaha and central lincoln counties will expire at 545 am cdt, the storms which prompted the warning have moved out of the area. therefore the warning will be allowed to expire. a severe thunderstorm watch remains in effect until 1000 am cdt for northwestern iowa, southwestern minnesota and southeastern south dakota. 6/22/2015 5:33 AM CDT At 532 am cdt, severe thunderstorms were located along a line extending from 6 miles northeast of rushmore to near sibley to near matlock, moving east at 65 mph (radar indicated). Hazards include 70 mph wind gusts. Expect considerable tree damage. damage is likely to mobile homes, roofs and outbuildings. 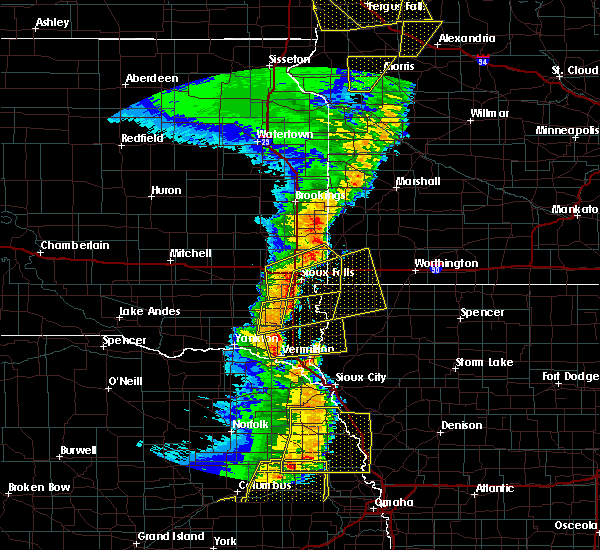 these severe storms will be near, worthington around 540 am cdt. ocheyedan, brewster and round lake around 545 am cdt. Other locations impacted by these severe thunderstorms include bigelow, magnolia, steen and kenneth. 6/22/2015 5:15 AM CDT At 514 am cdt, severe thunderstorms were located along a line extending from near hardwick to 6 miles west of ellsworth to near inwood, moving east at 70 mph. these are very dangerous storms (radar indicated). Hazards include 80 mph wind gusts. Flying debris will be dangerous to those caught without shelter. mobile homes will be heavily damaged. expect considerable damage to roofs, windows and vehicles. extensive tree damage and power outages are likely. these severe storms will be near, ellsworth, leota and lismore around 520 am cdt. adrian, little rock and wilmont around 525 am cdt. george and rushmore around 530 am cdt. matlock around 535 am cdt. 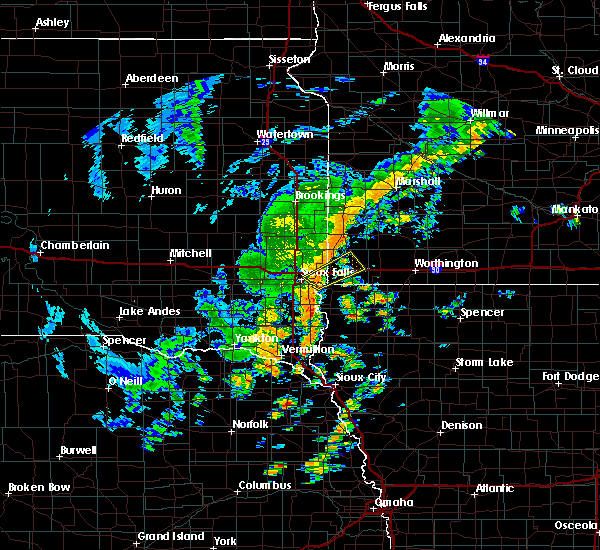 worthington, ocheyedan and ashton around 540 am cdt. sibley, brewster and round lake around 545 am cdt. Other locations impacted by these severe thunderstorms include bigelow, magnolia, steen and kenneth. 6/22/2015 5:06 AM CDT At 506 am cdt, severe thunderstorms were located along a line extending from 6 miles west of hardwick to hills to near canton, moving east at 65 mph. these are very dangerous storms (radar indicated). Hazards include 100 mph wind gusts. You are in a life-threatening situation. flying debris may be deadly to those caught without shelter. mobile homes will be destroyed. expect considerable damage to homes and businesses. expect extensive tree damage and power outages. severe thunderstorms will be near, lester and hardwick around 510 am cdt. luverne, rock rapids and blue mounds state park around 515 am cdt. ellsworth and alvord around 520 am cdt. rock valley, adrian, doon and lismore around 525 am cdt. hull, little rock, rushmore and wilmont around 530 am cdt. sibley, george and boyden around 535 am cdt. worthington and matlock around 540 am cdt. sheldon, ocheyedan, brewster and round lake around 545 am cdt. Other locations impacted by these severe thunderstorms include bigelow, magnolia, steen and kenneth. 6/22/2015 5:03 AM CDT At 502 am cdt, severe thunderstorms were located along a line extending from near sherman to valley springs to near harrisburg, moving east at 70 mph. these are very dangerous storms (radar indicated). Hazards include 100 mph wind gusts. You are in a life-threatening situation. flying debris may be deadly to those caught without shelter. mobile homes will be destroyed. expect considerable damage to homes and businesses. expect extensive tree damage and power outages. these severe storms will be near, hills and beaver creek around 505 am cdt. luverne, hardwick and blue mounds state park around 510 am cdt. larchwood and lester around 515 am cdt. The strongest part of this storm is near garretson, moving towards blue mound state park other locations impacted by these severe thunderstorms include steen. 6/22/2015 4:53 AM CDT At 452 am cdt, severe thunderstorms were located along a line extending from near baltic to sioux falls to near chancellor, moving east at 60 mph. these are very dangerous storms (trained weather spotters). 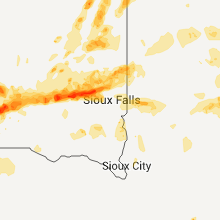 Hazards include 80 mph wind gusts on the west side of sioux falls. Flying debris will be dangerous to those caught without shelter. mobile homes will be heavily damaged. expect considerable damage to roofs, windows and vehicles. extensive tree damage and power outages are likely. 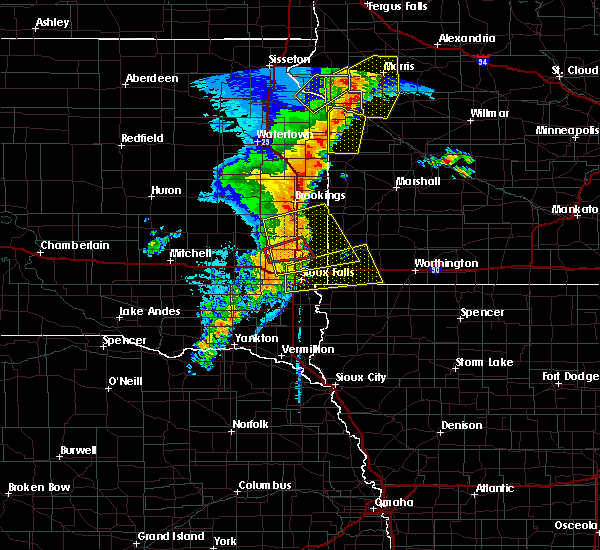 these severe storms will be near, sioux falls around 455 am cdt. brandon, garretson, sherman, rowena and palisades state park around 500 am cdt. harrisburg and valley springs around 505 am cdt. larchwood, hills, beaver creek and lake alvin state recreation area around 510 am cdt. 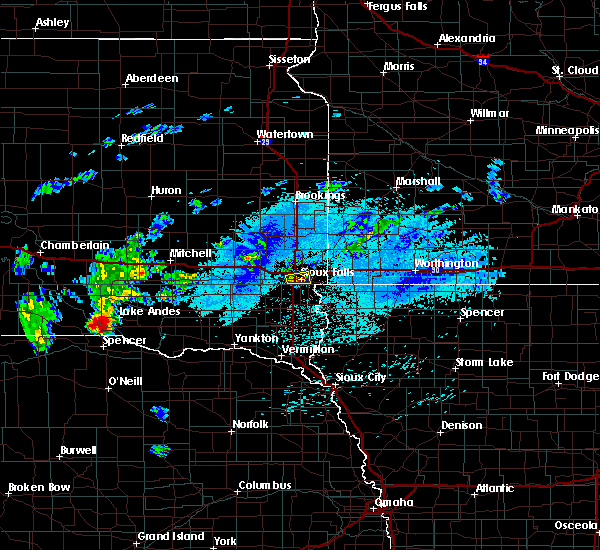 luverne, lester, hardwick and blue mounds state park around 515 am cdt. Other locations impacted by these severe thunderstorms include steen. 6/22/2015 4:41 AM CDT At 441 am cdt, severe thunderstorms were located along a line extending from near dell rapids to near crooks to near parker, moving east at 55 mph (radar indicated). Hazards include 70 mph wind gusts. Expect considerable tree damage. damage is likely to mobile homes, roofs and outbuildings. severe thunderstorms will be near, sioux falls, dell rapids, crooks and baltic around 445 am cdt. brandon and tea around 455 am cdt. 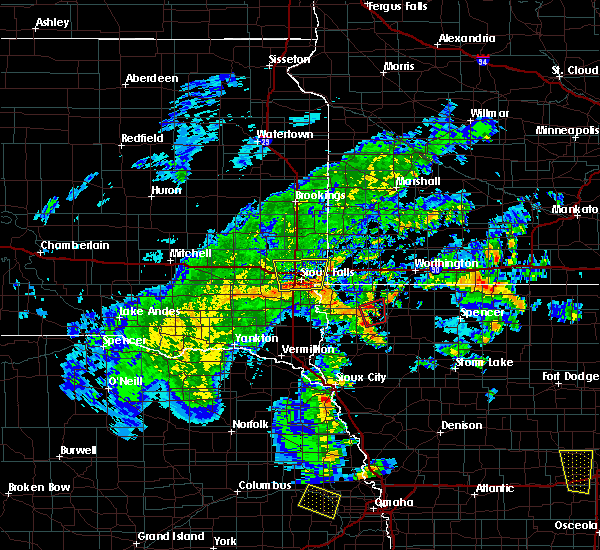 harrisburg, garretson, jasper, sherman and palisades state park around 500 am cdt. valley springs and lake alvin state recreation area around 505 am cdt. hills, beaver creek, trosky and rowena around 510 am cdt. luverne, edgerton, larchwood, lester, hardwick and blue mounds state park around 515 am cdt. Other locations impacted by these severe thunderstorms include steen. 6/22/2015 4:33 AM CDT At 432 am cdt, severe thunderstorms were located along a line extending from 7 miles southwest of chester to humboldt to near monroe, moving southeast at 55 mph. these are very dangerous storms (radar indicated). Hazards include 80 mph wind gusts. Flying debris will be dangerous to those caught without shelter. mobile homes will be heavily damaged. expect considerable damage to roofs, windows and vehicles. extensive tree damage and power outages are likely. 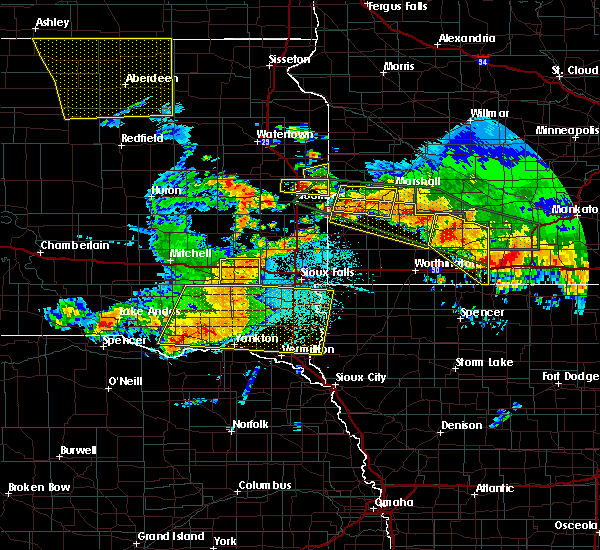 these severe storms will be near, hartford and wall lake around 440 am cdt. 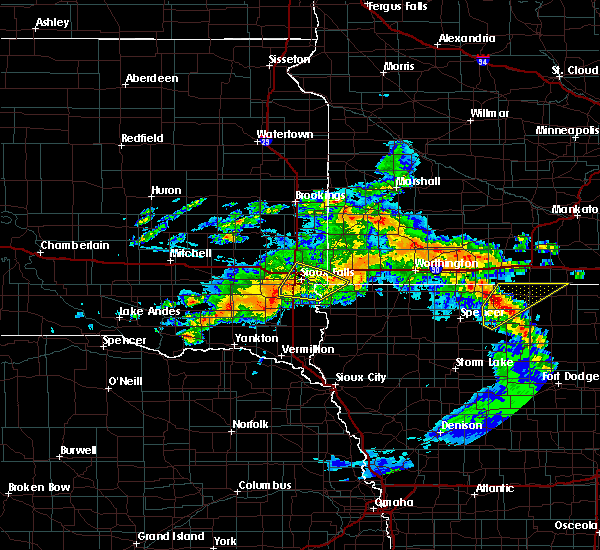 Sioux falls, crooks, baltic and chancellor around 445 am cdt. 6/22/2015 4:25 AM CDT At 423 am cdt, severe thunderstorms were located along a line extending from near orland to montrose to near canistota, moving southeast at 55 mph. these are very dangerous storms (radar indicated a couple of concentrated areas of wind developing north of montrose and acorss southern mc cook counties). Hazards include 80 mph wind gusts. Flying debris will be dangerous to those caught without shelter. mobile homes will be heavily damaged. expect considerable damage to roofs, windows and vehicles. extensive tree damage and power outages are likely. these severe storms will be near, lake vermillion state recreation area around 430 am cdt. humboldt and monroe around 435 am cdt. parker, hartford and colton around 440 am cdt. 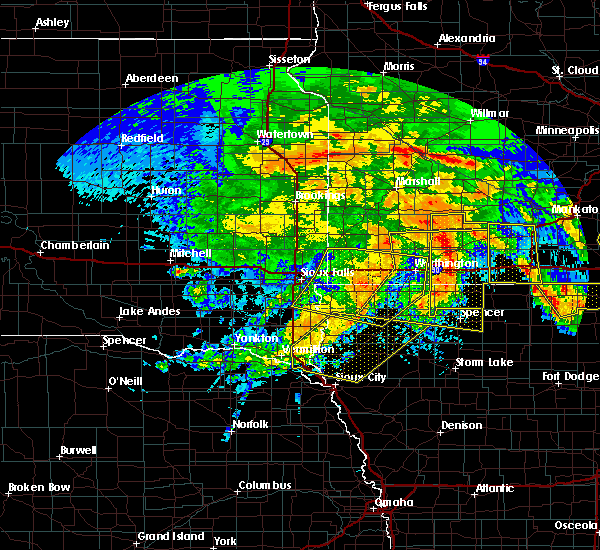 Sioux falls, crooks, wall lake and chancellor around 445 am cdt. 6/22/2015 4:21 AM CDT At 420 am cdt, severe thunderstorms were located along a line extending from near orland to near montrose to near salem, moving southeast at 55 mph (radar indicated). Hazards include 60 mph wind gusts. Expect damage to roofs. siding and trees. 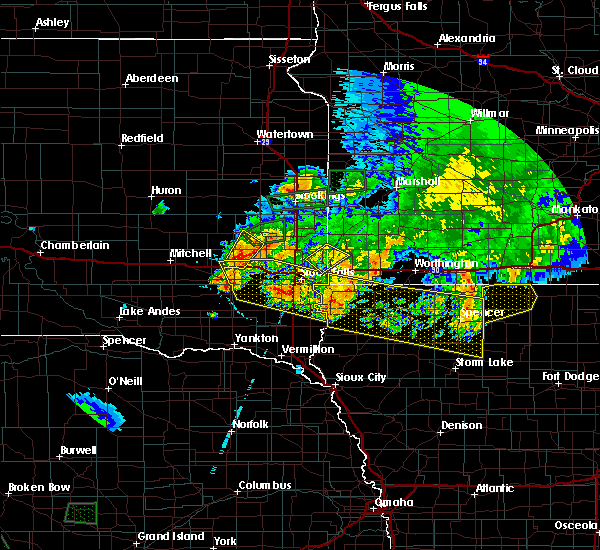 severe thunderstorms will be near, montrose around 425 am cdt. canistota around 430 am cdt. lake vermillion state recreation area, humboldt and monroe around 435 am cdt. hartford and colton around 440 am cdt. 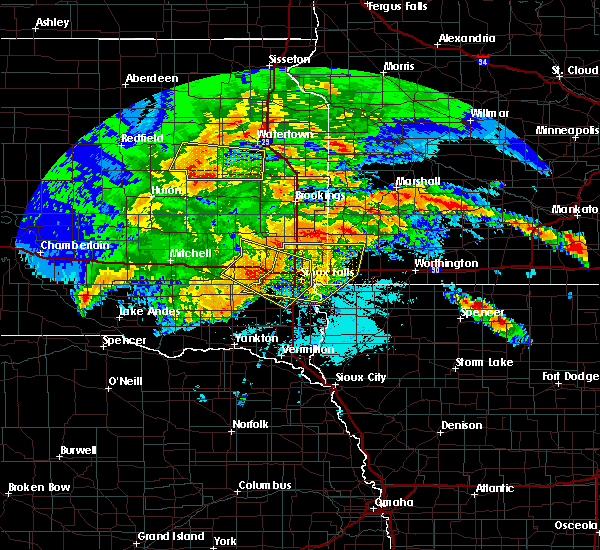 Sioux falls, crooks and wall lake around 445 am cdt.